Having a single employee wellness program for a worldwide company might seem impossible, but one corporation made global wellness work – and made it a charity benefit, too. In an effort to help its employees be healthier, more productive, and engaged, a large international company – we’ll call it Company X – started a wellness program that involved each of its 25 locations around the world. 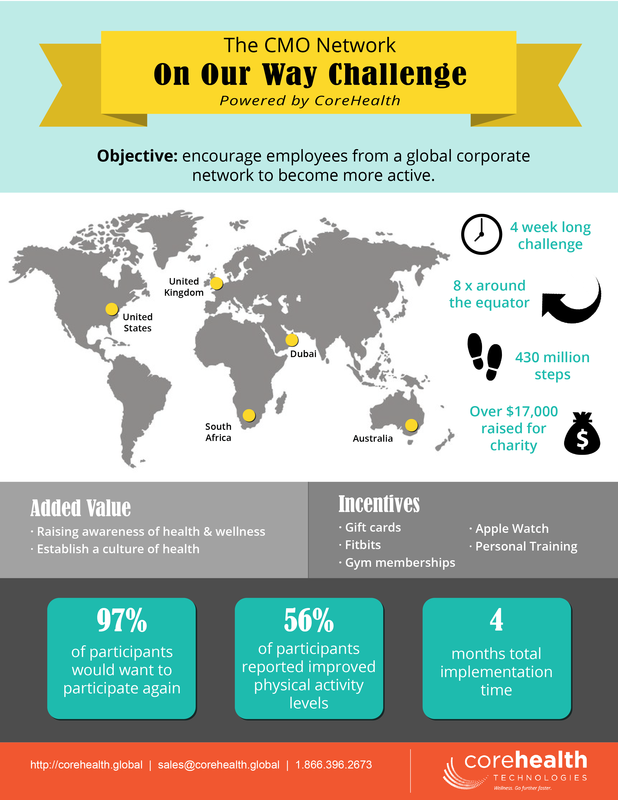 Their global insurance business partnered with CoreHealth to power a 4-week wellness activity challenge that engaged 60% of its eligible employees worldwide. Using these criteria as a starting place, Company X and CoreHealth worked together to create a global wellness portal and tailored it for different languages, cultures and geographies; used the flexible platform to include charitable giving (a priority for the employees); and branded all of their sites to meet customized requests. Wellness managers aimed to create a program that was simple yet effective, and decided on an activity tracker challenge that allowed team and individual participation. To boost to participation, employees could win wellness incentives just for participating. Company X gave out FitBits, Apple watches, gift cards, personal training sessions, and gym memberships, and made sure these were clearly communicated. In the weeks leading up to the kick off, communication was rapid and frequent. Company X relied on a combination of champions, in-person meetings, posters, emails, and the wellness portal’s social tools to inform employees about the challenge. General managers created videos for key location milestones, which were imbedded into the online portal to keep enthusiasm up. Employees opened 59% of emails about the challenge (vs. typical rates of 50-55%), and 43% of employees read every single email sent. Senior leaders were also important in maximizing engagement. Senior leaders acted as wellness champions and encouraged their teams to participate. Additionally, a network of employees in each location ran employee engagement activities and events to increase participation. Using communication and wellness management technology, Company X loved their 4-week wellness challenge. Employees competed in teams to virtually move around the world to visit all of the company’s 25 global locations. Steps were tracked on a world map through the portal, which helped to engage employees by seeing their individual and team progress. After initial setup, the platform synced to wearable devices like FitBit, making step tracking (and minutes of activity) easy and automatic. Alternatively, people could manually enter their activity. Any activity counted, making the challenge accessible to all. Each time a team reached one of the six main offices on the virtual map, about $1,500 USD was donated to Unicef’s Ecuador Earthquake Fund. In total, almost $8,000 was donated. Team and individual prizes were also given out during the challenge, including $4,000 USD to charities of the teams’ choice. In addition to wellness incentives, these gave the program a deeper meaning and were a motivating force within the challenge. The employees enjoyed the challenge so much that 97% of participants said they wanted the challenge to run again next year. Additionally, 56% of participants said the challenge contributed to them being more physically active. Each participant logged approximately 9,282 steps per day vs. the average sedentary person’s total of 4,000 – 5,000 steps. In total, the employees moved over 121,249 Km and donated over $17,000 to charity. To see another example of a successful wellness program, click HERE. 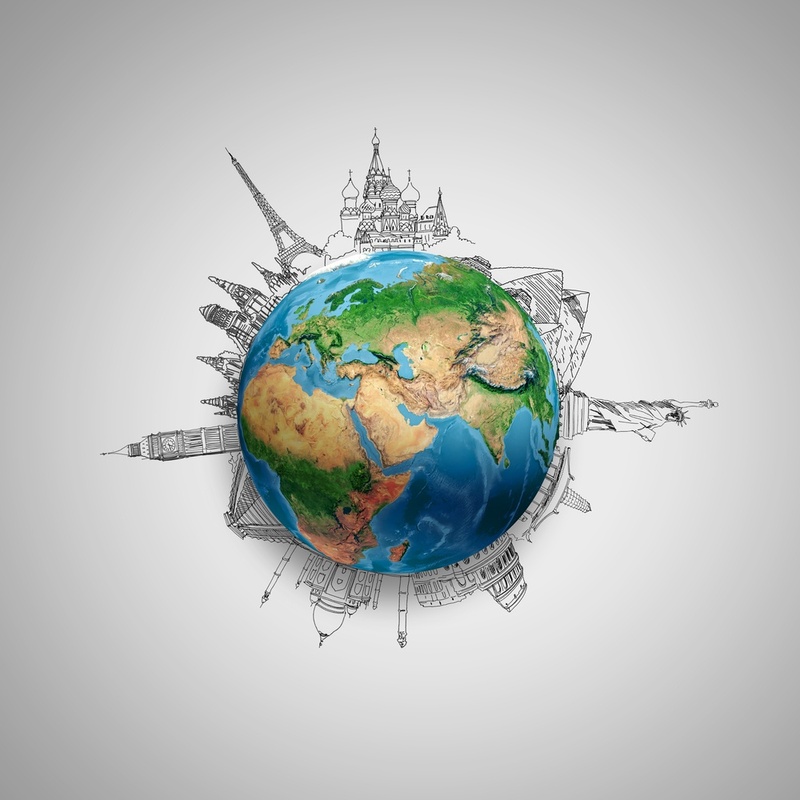 Ready to Launch a Global Wellness Program? See how CoreHealth can enhance your wellness programming - Book a demo. CoreHealth Technologies Inc. is the leading corporate wellness platform trusted by wellness providers for more than 1000 organizations, ranging from medium-sized businesses to Fortune 500 enterprises. At CoreHealth, we believe that developing the best employee wellness programs is all about giving wellness companies the right code, design and access to the latest innovations. With the most customization, integrations and reliability of any software in its class, CoreHealth’s powerful platform lets users focus on growing great companies. For more information, explore the CoreHealth website. 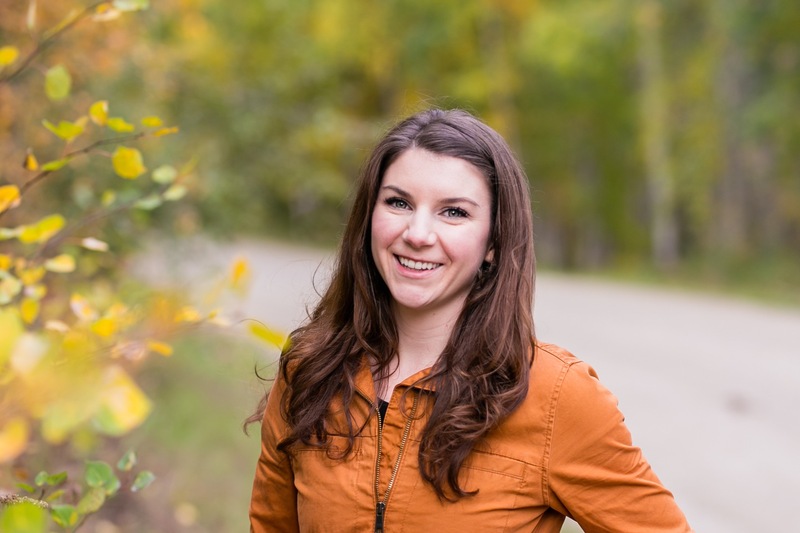 Laura Neuffer, M.S., has 9 years of experience in corporate wellness.